Red Bull recently published an amazing interview with Mahsa Homayounfar, a motorcyclist with a serious taste for adventure. Her travels have taken her across Asia, Africa, Europe and America, with each trip lasting between one and nine months. By day Homayounfar owns and operates a tour company, which she mainly operates online to ensure she can still travel and work. In the interview, Homayounfar repeats several times that it is the true independent and freedom which attracts her to touring adventures again and again, but her trips haven’t all been plain sailing. The real joy of a motorcycle holiday is jumping on the bike and hitting the open road, but when planning trips further afield, Homayounfar always finds shipping the bike a ‘headache’. If you’re planning to ship your bike abroad, you must ensure you do plenty of research before booking, to ensure you choose the best company and then most competitive price. Check the shipping T&Cs carefully, as you may need to dismantle the bike. Homayounfar prefers to travel solo, but she recount one particularly frightening story where back up may have come in handy. Whilst riding in the Persian Gulf she was hit by a car, badly breaking both her legs. Unfortunately the local hospital was not geared up to cope with her injuries, and so she was moved to another hospital without any pain relief. She had to arrange her own travel home, and spent over four months unable to walk. 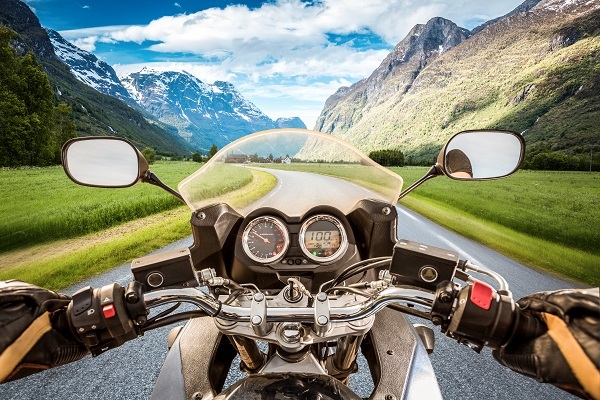 If you’re planning a motorcycle adventure, just remember to invest in specialist motorcycle travel insurance to protect you against any similar holiday disasters. Visit Holidaysafe.co.uk for more information.